Habit: Annual 2--6(13) dm. Stem: generally ascending to erect, often glandular, generally +- purple or brown. Leaf: basal in rosette or opposite, cauline generally alternate, sessile, generally linear to lanceolate, or oblanceolate, minutely dentate to (2-)pinnately lobed, glabrous or hairy, distal often stalked-glandular. Inflorescence: heads generally radiate, 1 or in +- open clusters; involucre +- hemispheric to bell-shaped, obconic, or urn-shaped, 2--15+ mm diam; phyllaries 1 per ray flower, in 1(2) series, lanceolate to oblanceolate, generally folded completely around ray ovary, falling with fruit, generally +- hairy or scabrous, often glandular; receptacle flat to slightly convex, minutely bristly, paleae free, generally in 1 series between ray and disk flowers, or subtending +- each disk flower, phyllary-like, more scarious. Ray Flower: (0)3--27; corolla white, often aging +- pink, to yellow or proximally yellow and distally pale yellow or +- white. Disk Flower: 5--125; corolla yellow, puberulent, sometimes glandular, tube < throat, lobes deltate; anthers +- dark purple or yellow to +- brown, tips narrowly triangular or +- lanceolate to ovate; style branches awl-shaped, bristly. ; anther bases obtuse to sagittate. Fruit: generally 2--5 mm, generally club-shaped, black; ray fruit compressed front-to-back, +- curved, beakless, glabrous or sparsely hairy, pappus 0; disk fruit +- straight, generally +- hairy, pappus 0 or of 1--32 awns, scales, or bristles. Species In Genus: 14 species: western North America. Etymology: (George T. Lay, early 19th century English plant collector) Note: Generally self-sterile (except Layia carnosa, Layia hieracioides, sometimes Layia chrysanthemoides). Habit: Plant 8--60 cm, glandular, not strongly scented. Stem: straw-colored, not purple-streaked. Leaf: < 5(8) cm, oblong to oblanceolate, +- glaucous, generally scabrous-ciliate, proximal +- lobed. Inflorescence: peduncle 1--12 cm; involucre 4--10(13) mm, +- hemispheric; phyllaries 3.5--8(11) mm, tip < or > folded base, interlocked by cottony hairs. Ray Flower: 6--15; ray 3--12(19) mm, white. Disk Flower: 20--100+; corolla 2.5--5 mm; anthers yellow to +- brown. Fruit: ray fruit sparsely hairy; disk pappus of 10--13 scales, 2--3.5 mm, +- equal, lanceolate, acuminate, white, ciliate, not adaxially woolly, base sparsely bristly. Chromosomes: 2n=14. Ecology: Grassy or open heavy soil; Elevation: 100--350 m. Bioregional Distribution: w edge Teh (Comanche Point, Tejon Hills), s SnJV (extirpated). Flowering Time: Mar--Apr Note: Threatened by development. 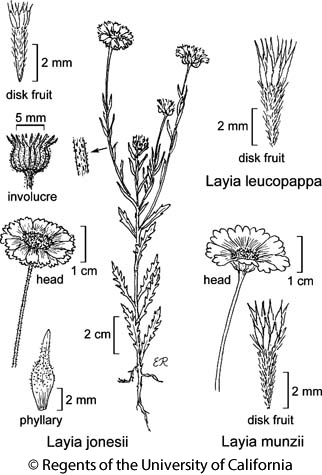 Citation for this treatment: Bruce G. Baldwin & Susan J. Bainbridge 2012, Layia leucopappa, in Jepson Flora Project (eds.) Jepson eFlora, http://ucjeps.berkeley.edu/eflora/eflora_display.php?tid=3753, accessed on April 22, 2019.
w edge Teh (Comanche Point, Tejon Hills), s SnJV (extirpated). Markers link to CCH specimen records. Yellow markers indicate records that may provide evidence for eFlora range revision or may have georeferencing or identification issues. Purple markers indicate specimens collected from a garden, greenhouse, or other non-wild location.